December 2018. Seasons are changing and so is Maple Valley! We’ve been shifting a few things in the business and are now flowing and loving our new arrangement. We, Micah & Rose, plan to spend several months in Kenya this winter to help establish a new orphanage while our faithful family members will continues to provide the service that Maple Valley is known for. This is where we’ll be staying in Kenya! 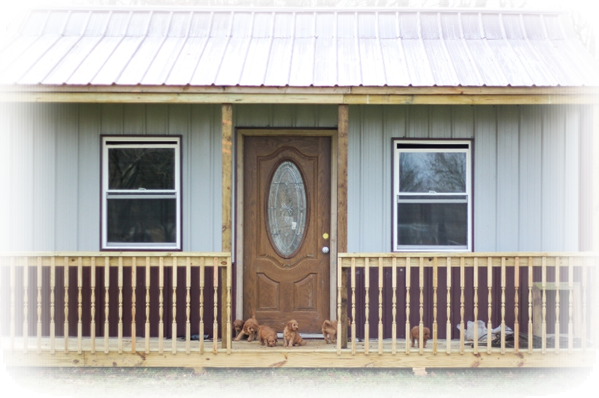 We are an animal loving family that thrives on our life in the country! We have 20 acres of pasture and woodland here in central Illinois. Foxes, squirrels and deer plus lots of songbirds add to the peaceful setting. We both grew up on farms. Micah’s family raised turkeys and my (Rose’s) family had an ‘Old MacDonald’ farm with a little bit of everything, but specializing in horses. Our families both raised some puppies to sell. 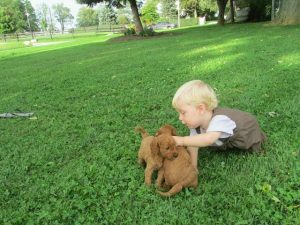 In 2012, Micah had a friend that was raising goldendoodles, but he planned to move out of state and couldn’t take his dogs with him. Hence, our introduction to the lovable ‘doodle. 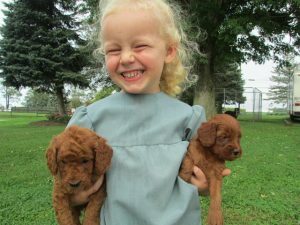 We have been raising goldendoodles since then. We strive to produce top quality, healthy puppies that will make wonderful pets for years to come. Customer satisfaction is of utmost importance to us. See our Puppies ready for Adoption!